ne of the greatest challenges of youth ministry in a post-Christian era is weaving culture and Christ into the same conversation. The church has made enormous strides and some mistakes in this journey, and we will continue to do so as long as we attempt to engage young people where they are. Helping them understand and embrace “calling” has been and will be no less challenging. Calling has never been a discussion of convenience . . . and our society begs for convenience. Consider your cell phone. Lost and need directions? There is an app for that. Looking for a specific type of restaurant? There is an app for that. Need to purchase something on the fly? Well, there is an app for that too. Just like downloading an app to our phones, we must assess needs, investigate options, and apply choices to lead youth into their callings. Each person and each ministry context is responsible for communicating with Christ and coordinating with the Holy Spirit to gain the information needed to make the decision God wants. Years spent leading and investing in the lives of youth has led me to two general conclusions about mentoring them. First, without the trust that comes with investment, I have no voice; second, young Christians continue to pay a heavy price for their faith. For the last two years, I have been blessed to lead the Church of God Winterfest event for Southern California. One of the most encouraging outcomes is seeing youth crowd the altars not just for salvation and deliverance, but also to find their calling. They are hungry to be used by God. In one altar service alone, more than 100 youth came forward with a confirmed call to ministry. There seems to be a genuine resurgence of passionate young people who are serious about Jesus, His calling on their lives, and their commitment to discipleship. Culture has sharpened the edge of choice—either you are in or you are out. Christian American youth are conviction-driven. It’s a costly choice, and youth want to know what they are giving up their lives for. Religion in America, especially among youth, is not passive. The status quo is unacceptable. Our summer church camps and youth retreats may not be as popular as they once were, but those who come do so with reason—to be used of God. To mentor and train, we must understand as Christians we are all called in two fundamental ways—vocation and our highest/ best use. The secularization of America is pressing for the polarization of these two realities. In Christ, there is no distinction between sacred and secular calling. We do not work in factories and corporations by day and become Christian superheroes by night. Being a high school student is sacred. Playing sports is sacred. Working at a fast-food restaurant is sacred. Going to church is sacred. This is the call. always been to our highest and best use in every capacity (1 Cor. 10:31). God is relentless in His pursuit of us. The billboard of society may scream that youth are abandoning faith; but to the contrary, they are abandoning dead-weight mechanisms that are too heavy to carry with so much at stake. They want an “app” that meets their needs, navigates them through life, and ushers them into the full purpose of God. God has not changed one degree to the left or right. He is always calling. He is always leading. He is always searching for the next generation of willing vessels. As leaders, we must have the passion and commitment to help our youth find and develop the calling God has for them. The worth of an app is found in its ability to meet the needs of the person who is using it. The app needed for your church or student ministry must be built exactly that way. There are many highly beneficial materials that exist to help leaders train and mentor students. Yet, a copy-and-paste approach to discipleship and training is rarely effective. Take in all the information you can, process the information through your ministry framework, apply what fits, and discard what doesn’t. This takes hard work, prayer, wisdom, and commitment. Exposing a few myths will speed the process. • Myth 1: You have to have a large group of students. • Myth 2: You have to have the perfect facilities. • Myth 3: Only experts can train and mentor. • Myth 4: It is expensive to mentor and train youth. • Myth 5: Whistles and buttons are better. Jesus took 12 men who had virtually none of these things and changed the world. Our student ministry has 18 leaders who are in ministerial training (CAMS or MIP) or are licensed ministers. We have more who cannot wait until they are old enough to begin the process. How have we done it? We have built apps that work for our student ministry. We have made it an intentional part of our church, leadership, and vision to train youth for ministry. From children to college, we train students for ministry, and apply that training in legitimate ministry contexts. We offer courses on everything from teacher training to sermon preparation. Students also have access to online, DVD, and face-to-face formats for learning basic doctrine and statements of faith. At Easter, one of our main focuses is a children’s ministry outreach. Over 600 nonchurched children came to our outreach last year that is nearly 100 percent led and staffed by youth. In addition, each year the students play a large role in our “Hope Fulfilled” ministry to single moms and their families. Students translate, serve food, perform skits, lead worship, and load cars with groceries for the families. In Texas, Ecuador, and in many other venues we have sent as many as 50 students and leaders to train, witness, and preach on their own funding. There is possibly no better opportunity to help youth discover their calling than missions work, domestic or abroad. Every age group of our student ministry has an age-specific opportunity for worship. 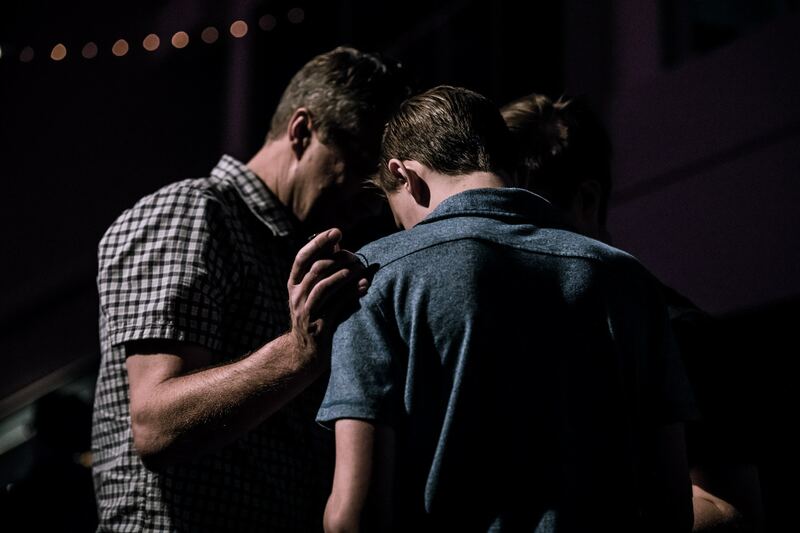 This is their time to connect with God and define their callings. This is where students learn to worship with their peers, pray for their peers, and serve with their peers. Here are five fundamentals for building the student ministry app you need. 1. While money is important, it does not drive ministry. Passionate people drive ministry. No amount of funding will be enough to cause youth to want to discover and develop their calling. The app that works is connecting young people with their passion. 2. Investment comes with a price called opportunity. Training does not always yield the immediate results we desire. Mentors take risks and make mistakes. Youth will do the same when given the chance to practice and develop their calling. However, the investment of heart and skill training will yield results. 3. Environment is everything for development. We must create an atmosphere where leaders train leaders. My pastoral team has one job: find, recruit, and train others to do ministry. We must become facilitators of a volunteer force. Empower and equip others to serve, and they will. 4. Potential is most often seen in glimmers. An act of compassion, eagerness to serve, or a glimpse of influence is sometimes the only clues you will get to discover a goldmine of ministry in a young person. It’s not the tons of dirt you dig through that makes one wealthy; it’s the few flakes of gold found in the midst of it. We must keep our eyes open for every possibility to develop our students. 5. Open doors and open minds will generate energy and build momentum. Allowing your students to create and work within their own ministry context is a huge paradigm shift. Remember, the app is designed to support them, not us. Our job is to help them establish the boundaries, understand the potential hazards, give them the tools they need, and support them every way we can. Remember, we are all called of God to do a work for Him, which requires a willing heart and an obedient spirit. As leaders, our call is not to get more people; it’s getting the people we have to get more people. There is an app for that, but we have to be willing to build it.